First swims and claimed swims. Things are getting busier, with well over fifty swimmers in last night in a steady stream from 5.00 onwards. Sea temp was clocked at 11.7c and certainly was very warm close to the beach. Cousins, Drew and Abby Lynch did their first ever swim to the Dutchman. They said they’d have been much faster if they didn’t have to keep stopping to let uncle/dad, Bernard catch up. However, they were very definitely not happy girls afterwards. 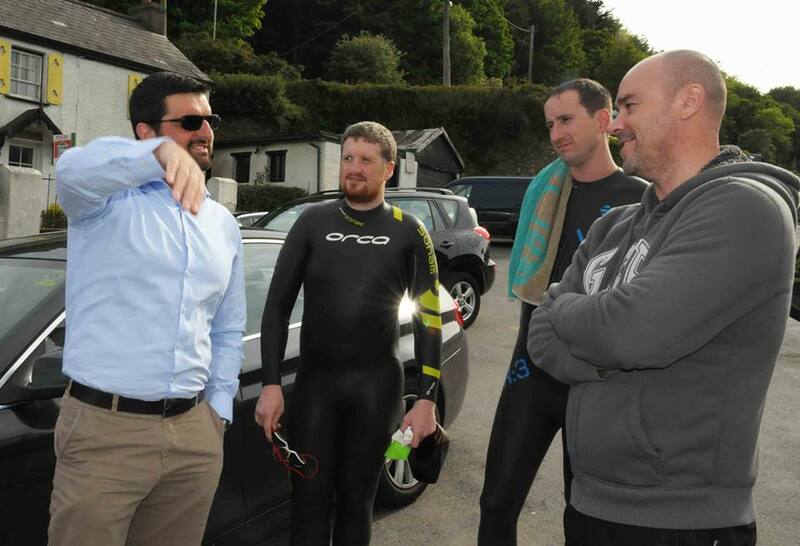 After everything they’d heard about Myrtleville there were —- NO CAKES! Disaster. 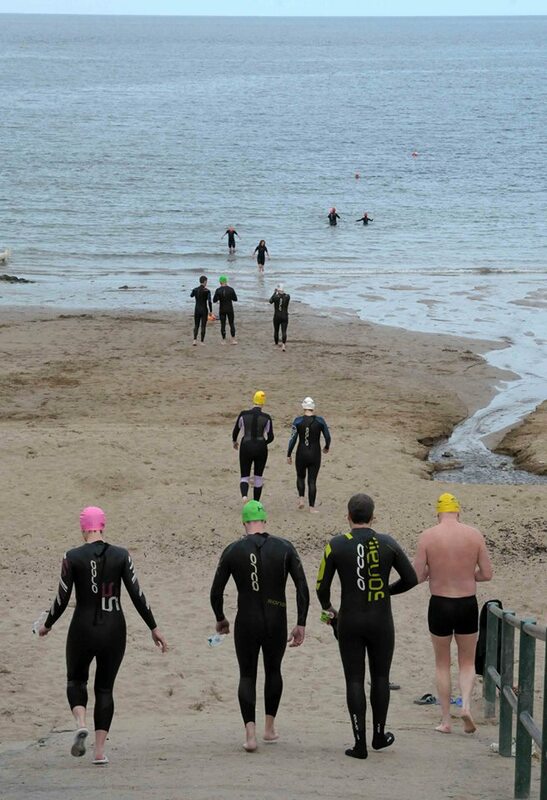 Trevor Malone continued his preparations for his Channel swim in a couple of months. No doubt he’s feeling much more positive after getting a bit of technical advice on his stroke from Gary Frost. Dowtcha, Gary. Following the guidance on swim entries, one applicant decided last night was the night to appear to set the record straight and get a 1,500m in the sea ratified. 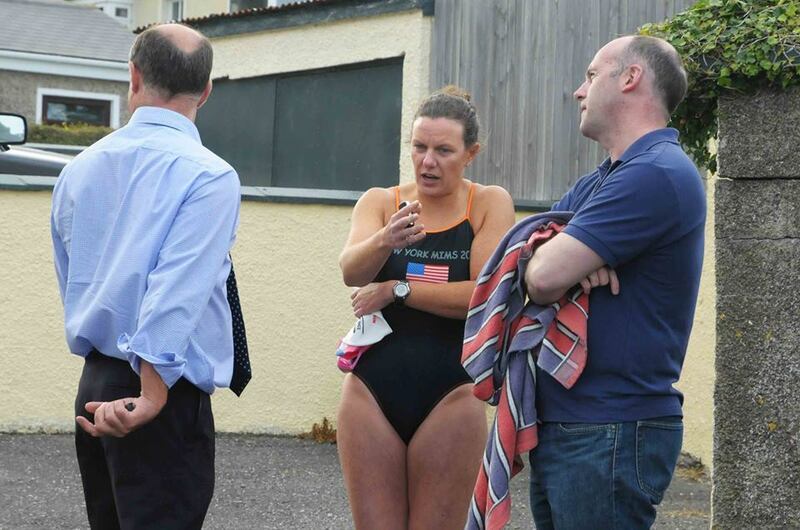 Prior to actually doing any swimming, she forcefully put her case to Irish Swimmer of the Year 2015, Ciaran Byrne and Bernard “I’m looking at something else, not listening” Lynch. She talks a great 1,500m, does Carol. 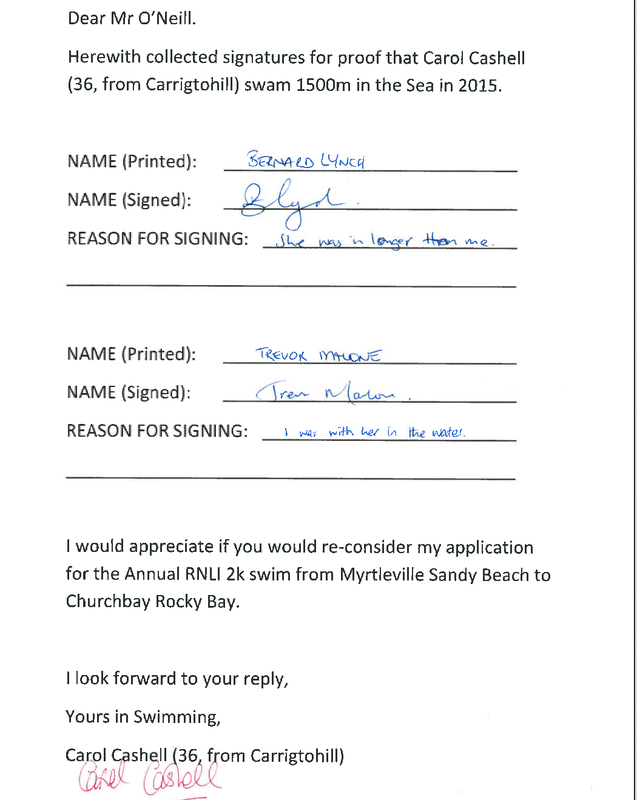 Following her swim with Trevor Malone – of undetermined and un-ratified distance and direction – the following form was submitted this morning. To be frank, the form raises more questions than it answers. The Reasons for Signing are “She was in longer than me” and “I was with her in the water”. Neither state that they actually witnessed or can ratify a 1,500m swim from yesterday. I mean, if she’d just tried to keep up with the Lynch girls going out to the Dutchman, that would have been it – job done.